From Laquan McDonald to Homan Square, Rahm has tacitly endorsed police violence. In the coming months, a jury will consider the fate of Chicago police officer Jason Van Dyke, who has been charged with first-degree murder for shooting 17-year-old Laquan McDonald 16 times at close range. Police originally claimed that McDonald had lunged at officers with a knife, but the dash-cam footage released last month showed no such dangerous move. Instead, the tape showed Van Dyke pumping bullets into the teenager as he lay on the ground. As the case advances through the legal system, Chicagoans are left to consider the political future of Mayor Rahm Emanuel, who appears to have done everything in his power to prevent this case from reaching a courtroom. That verdict may already be in: A recent poll showed that a majority of Chicagoans want Emanuel to resign, while less than 30 percent support his remaining in office. We agree with Chicago: Rahm Emanuel must go. Van Dyke appeared to be sitting pretty after the October 2014 killing. Unbeknownst to the public, police officers had visited a nearby Burger King whose security cameras had seemingly captured damning footage of the incident and, according to the manager, deleted it. Van Dyke wasn’t even named in the shooting, and the story caused only a small blip for the Chicago media. By December 2014 at the latest, Emanuel’s office knew about the dash-cam footage, according to records recently obtained by NBC Chicago. But nothing happened until April of this year, when the city paid McDonald’s family a preemptive settlement of $5 million. The curious timing—the settlement came only after Emanuel faced a primary election and then a run-off vote—along with a clause to keep the dash-cam video secret, had all the trappings of hush money. It also strongly suggests that the city must have known just how incriminating the footage was, and that its release would all but guarantee a murder charge against Van Dyke. And still the city fought. Officials might have prevailed, had an independent journalist not sued to compel the video’s release to the public. Emanuel’s lawyers and Cook County prosecutors went to court to oppose the suit, arguing that releasing the video would compromise a state investigation—despite the Illinois attorney general’s clear statement to the contrary. When a judge finally ordered the video released last month, Van Dyke was arrested and charged with murder. But in what sense was Emanuel not trying to cover up the officer’s crime? It’s clear to many in Chicago that he was. 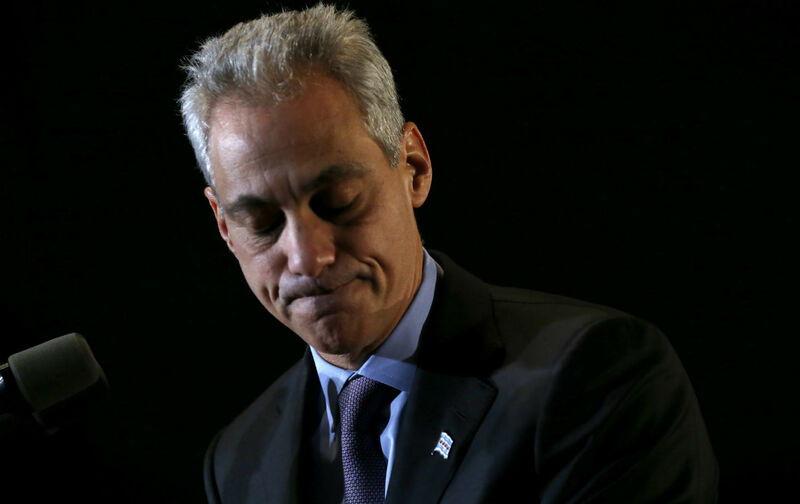 Emanuel’s approval rating currently sits at a pathetic 18 percent. Black Lives Matter activists have repeatedly taken to the streets to demand his resignation, and they’re supported by a wide swath of the city’s residents, like the medical students who held a white-coated die-in at City Hall to protest the public-health crisis of police killings. The horrors of Homan Square are still fresh in the minds of many there; a Guardian investigation earlier this year revealed that Chicago police were running a secret detention and interrogation operation from that site, also under Emanuel’s watch. If Emanuel doesn’t resign, a recall effort may do the job for him: Less than 90,000 voter signatures are needed to recall the mayor under legislation that was just introduced in the Illinois General Assembly by a representative from Chicago. But Emanuel should spare everyone’s time and start the healing process in the city by stepping down now.